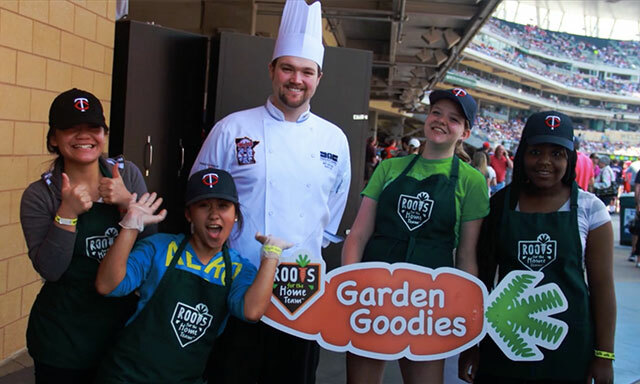 Roots for the Home Team provides valuable skills for Minnesota’s inner city youth through partnerships with local garden programs and sports organizations. 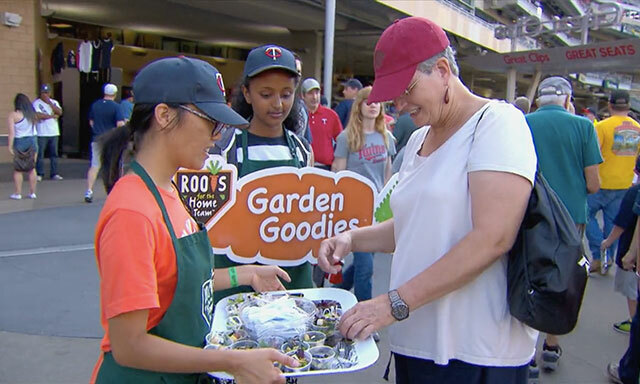 When the Minnesota Twins moved from the Metrodome to the open air of Target Field, Twin Cities dietician and baseball fan Sue Moores had the perfect community outreach idea for a major league team playing in its natural environment. Inspired by youth garden programs across Minneapolis-St. Paul, Sue recognized an opportunity to merge the food pyramid with the corporate ladder. Her idea was to introduce inner-city kids to the joys of food preparation while teaching salesmanship and communication skills by selling the creations at Twins games. In 2012, Roots for the Home Team was created. Roots for the Home Team gives kids a view of the world outside their neighborhood. Today, Sue works with youth from four garden programs in the Twin Cities. Together, the kids grow and maintain vegetable gardens and partner with local chefs to develop salad recipes. Chefs at Target Field prepare the recipes for the kids to sell directly to fans at home games. Impressively, the salads almost always sell out. Roots for the Home Team has grown from annually reaching 140 youth and serving 830 salads at one venue to reaching 230 youth and serving 1,600 salads at multiple venues. More importantly, Roots gives kids a view of the world outside their neighborhood, exposes them to food- and business-related careers, and connects them with valuable mentors. The youth we work with are hungry for opportunities. Roots for the Home Team introduces at-risk kids to the art of culinary creation by giving them recipes for success.